Why get out of bed if you don’t have to. Why go in the bag when you can hide under it. Much fun was had “attacking” the pink ball. Showing off her beautiful tail. Yesterday Seven ran out of energy, went to sleep in her hut and didn’t wake up again. She made it to the very respectable age of thirty-three months, outliving her sister, Nine, by more than five months. Seven started losing the strength in her back legs towards the end of last year and that slowly worsened over the following months. Although she couldn’t clamber around the cage any more, she did still manage to somehow — sheer determination, I think — get up onto the lower platforms and even into the tube hanging on the cage door so she could see the world going by. The other morning she managed to climb out of the cage onto my lap for a cuddle while I was doing the morning medication rounds. She slowly turned into an old rat; still adorable, but life was obviously becoming more of an effort. We’d known for a while that she wouldn’t be with us for much longer and were dreading having to make that decision for her. She kept going right up to the end, she had some time out of the cage and a wander around my office earlier in the day, before settling back into her spot in the cage and going peacefully to sleep. Never the smartest rat, but always the sweetest of them, and the one with the softest, most strokable fur, Seven will be sorely missed. Codepope was out tonight, so it was just me and the ratties and a quiet night curled up on the sofa. But first I had to gather the girlies. This is a process that takes an unpredictable amount of time. Tonight everyone was snuggled up in the sputnik when I went to get them out — awake but far too comfortable to dash out to see me without some coaxing. River needed only a hand to climb onto, a few words of encouragement and a promise of snacks to persuade her out. Song refused to come out until she could actually see the snacks. Seven is too smart to ever be lured out of anywhere by mere food and has to be gently nudged until she decides she wants to move (sometimes it’s just easier to leave her for ten minutes until she realises she’s the only one left in the cage and comes out to see where everyone has gone). Then I curl up with a fleece blanket over my knees, creating a cosy tent for them to hide in (they are lazy ratties and love this). All is quiet until they notice that I am trying to enjoy a cup of tea and a biscuit. A flurry of activity ends with Song hanging off the biscuit by her teeth and me having to admit that even I would not be prepared to eat the rest of it even if I could rescue it. Once everyone has had a bit of biscuit, they all settle down again and I practise typing with one hand as River decides to fall asleep on my hand. Song hides in a paper bag, looking guilty. And then, having written that a few days ago, Nine obviously decided I was getting too complacent about her health and decided to give us a scare. In the early afternoon, I suddenly noticed a lot of raspy, wheezy, respiratory-problem type noises coming from the cage — it was Nine. I took her out and held her and could feel the rattling through her rib cage. Knowing how quickly ratties can go downhill and given that she’d been fine earlier that day, I worried that this could be the infection that would be the last straw for her — so I phoned the vet and got an appointment for that evening. Once she’d settled down a bit, I put her back in the cage and went to try to find something to distract myself with for a couple of hours. When I went to get Nine into the carrier, she was laid half in and half out of a fabric cube in the corner of the cage — nothing unusual there, her lump is large enough that it can be tricky to manoeuvre at times. What was unusual was all the other rats (we have four in total, I’ll introduce the others soon) being in there with her. Normally, she either has a corner to herself or just one of the others for company. And the others did not want to move. I had to lift them out of the way so I could get to her. Her lump was cool to the touch and she didn’t respond when I moved her tail. Now I was really worried, thinking that maybe the vet appointment wouldn’t be needed. I lifted her out of the cage and she woke up. Not exactly her usual perky self, but responsive. I sat with her for a while, letting her doze under my t-shirt, and then we headed out to the vet’s. And by the time we were seen, she was absolutely fine again. I felt like a fraud describing how poorly she had seemed only an hour before. She had a bit of a chest infection — the vet had “heard worse” — and was prescribed a course of antibiotic injections. She was so much better by the time I took her for the second injection three days later that the vet didn’t think she needed any more. And that was two trips to the vet. The third visit was with Seven. When the ratties came out for their evening lazing around on the sofa, Codepope noticed that Seven’s right eye was looking very pink, like the light was reflecting in it oddly. She didn’t seem to be in any pain and her vision didn’t seem to be affected, but it definitely wasn’t right. I did some reading around and came to the conclusion that it was probably the lens slipping out of position. So off to the vet again. Trying to keep a very wriggly rat still enough for someone to get a decent look in her eyes is almost impossible, and I have the scratches to prove it — she even squeaked to show how unhappy she was with the whole palaver. But eventually the vet got enough of a look and agreed that a slipped lens seemed the most likely diagnosis. There isn’t much that can be done about the lens, it’s really a case of watching out for secondary problems like increased pressure in the eyeball which can lead to glaucoma. She has to go back the next time Nine goes in for her regular check-up and fingers crossed there are no more problems in the meantime. If there are, then she’ll probably have to be given a whiff of gas so they can get a proper look at her eyes and we could even end up having to see a specialist with her. Health-wise, Seven has, so far, been pretty lucky. The occasional mild respiratory infection and one gunky eye which we had the joy of putting cream into — drops would have been relatively simple, but it was a definite two-person job to time getting cream onto her eye and not have it blinked straight off again. She’s two years and two months old now and showing no signs of her age other than being less manic and enjoying curling up on the sofa more than dashing around on it. Unfortunately, Nine hasn’t been so lucky. Along with the intermittent mild respiratory problems, she has turned into a lumpy rat. Just before Christmas last year I noticed a small lump on her rib cage, which was diagnosed as a mammary tumour and removed. She recovered well from the operation, but, in late January, I noticed another, less well-defined lump near her groin. This one was deemed inoperable. I wasn’t sure what to expect. I’d read up on these things and knew that they could quickly grow to overwhelm a rat or leave them weakened and vulnerable to other infections, so I wasn’t hopeful of her lasting another month, never mind reaching her second birthday; however, with the aid of a prescription for Tamoxifen, she did, and she made it to the second anniversary of coming home with us, and she’s still fighting now. Her movement is being limited and she can’t climb any more. I think I find it more painful than she does, but I can see it is slowly taking its toll on her. Still, her appetite is very good, she’s alert and doesn’t seem to be in any pain, so we have to take each day as it comes. Update: Rats being contrary creatures and obviously aware that I’ve been writing about how stable their health is at the moment, both of them have decided to prove me wrong since I prepped this post and I have my third vet visit of the week this afternoon… Details later. Our first pair of rats. Both girls. Seven and Nine. Named, by Codepope, after Seven of Nine from Star Trek; this has to be explained to everyone they are introduced to. They were born on or around 1st June 2011, not sure of the exact date as we were just told they were about eight weeks old when we took them home on 25th July. 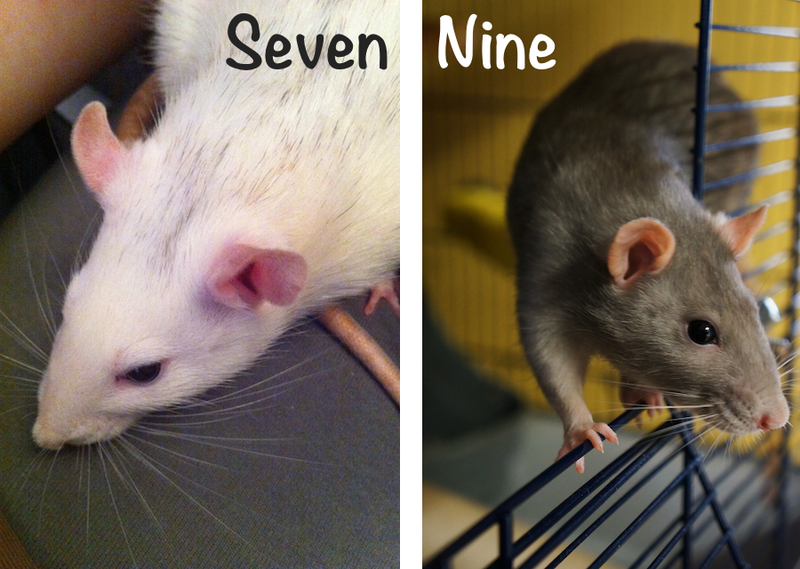 Nine is a black-eyed, blue, mis-marked Irish (has a small lop-sided white triangle on her chest), top-eared rat. She weighed around 180 grams when we got her and has always been the biggest girl, breaking 500 grams at one point; her physical stature matching her position as alpha rat in the cage. As alpha, Nine ruled the cage quietly, though she always has had her manic moments when dashing around was the thing that had to be done right there and then. Seven is a ruby-eyed, white with a smattering of grey, top-eared rat. She has always been the smaller of the two girls and also the most energetic. She is the sweetest rat and also the derpiest, and she has the most luxuriously strokable fur. They both liked to run in the wheel when they were younger: Nine ran smoothly and elegantly, while Seven bounded along in a way that never failed to raise a smile. Nine would jump when the mood took her, but Seven never seemed to see the point (or possibly she never saw the destination — being ruby-eyed her vision isn’t that good). Always a bit clumsy, Nine’s the most likely to slip while walking along your arm, leaving a nice set of scratches. And, yes, they both have very sharp claws. Nine is also the only rat to have ever bitten me and drawn blood, but, of course, it was my fault, or at least the result of my inexperience… No matter how much research you do, there are always a few salient facts that pass you by, like the fact that rats can sleep with their eyes open. I reached into the cage to stroke her, thinking she was awake and could see me coming, when in fact she was fast asleep and very startled. Live and learn. They have very different personalities, but are both utterly adorable.